It has been fifteen years now since I published an annotated checklist of the longhorned beetles (families Cerambycidae and Disteniidae) of Missouri (MacRae 1994). That publication (and a similar one on Buprestidae) was the product of eight years of collecting – of specimens in the field and of data in any other public or private collection I could find that contained Missouri specimens – during my stint as a field entomologist with the Missouri Department of Agriculture. I collected during the week while on my rounds. I collected on weekends as well. I visited every college and university in the state that had an insect collection of any size, and a few in neighboring states as well. I made the acquaintance of private collectors with significant Missouri material – most notably Richard Heitzman, Marlin Rice, and the late Gayle Nelson. 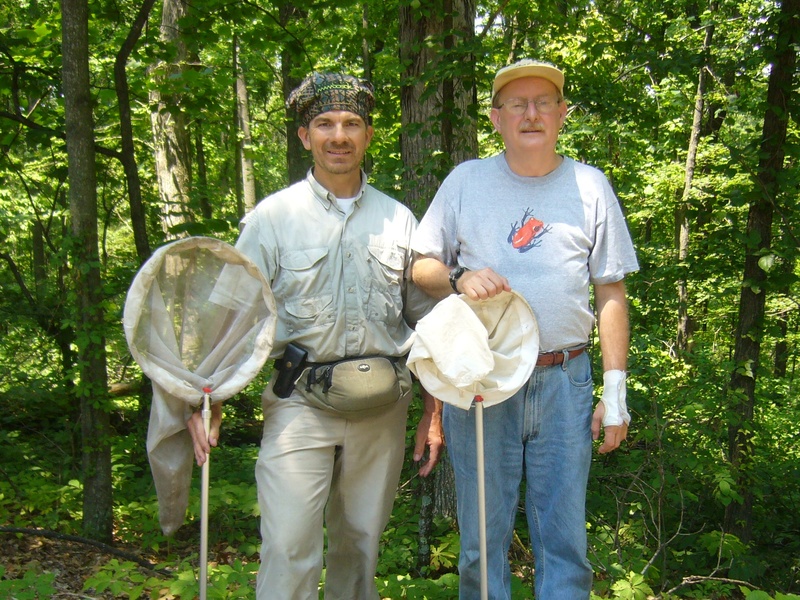 By the time I left Missouri for a new position in Sacramento, I had documented 219 species and subspecies of longhorned beetles from the state – 66 of which were new state records. Despite my best efforts, however, I knew the list was not complete – they never are. In the years since returning to Missouri, I’ve documented an additional 10 species and subspecies in the state (MacRae and Rice 2007), and in a newly published paper (McDowell and MacRae 2009) the rare species, Typocerus deceptus, is documented from Missouri for the first time. I cannot take credit for this discovery – that honor goes to the paper’s lead author, Tom McDowell of Carbondale, Illinois. Tom first encountered this species in 2005 at Trail of Tears State Park in southeastern Missouri near Cape Girardeau while conducting routine insect surveys. After seeing additional individuals on a subsequent visit to the park the following year, Tom contacted me to tell me of his find and graciously invited me to join him on further studies of this rarely encountered species. I readily agreed, and in July of last year I met up with Tom at Trail of Tears to see the beetle for myself. 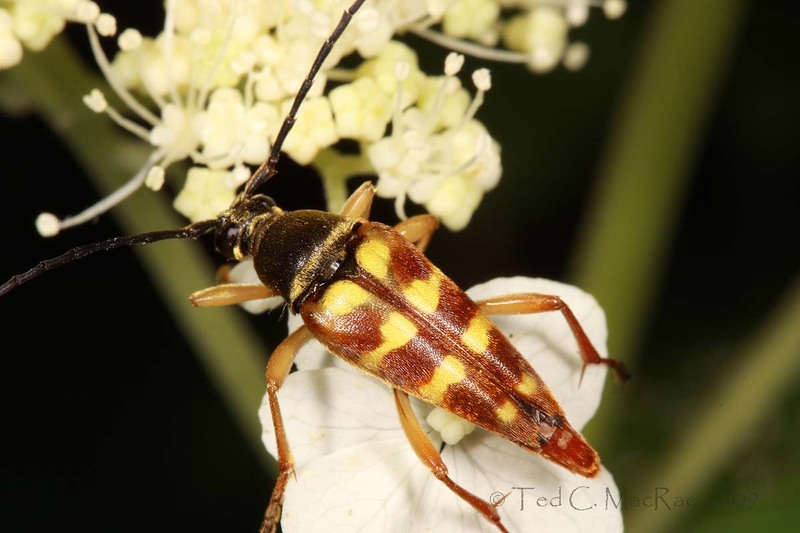 Typocerus deceptus has been recorded sporadically from across the eastern U.S. Nothing is known of its biology other than adult flower hosts and activity periods, and the larva and larval host(s) remain completely unknown. The species is aptly named, as its appearance is deceptively similar to the common and widespread species, T. velutinus. 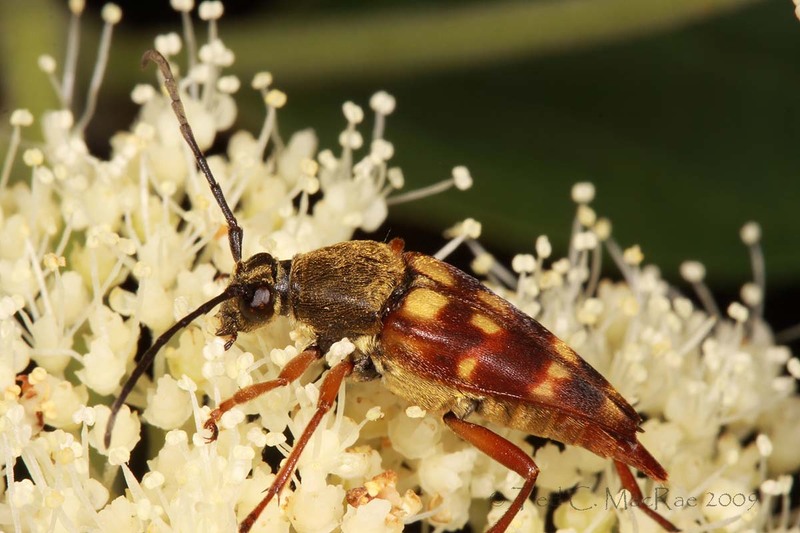 Both of these species belong to the so-called “flower longhorn” group (subfamily Lepturinae), characterized by adults that are largely diurnal (active during the day) and attracted to a great variety of flowers upon which they feed. Tom had found T. deceptus feeding on flowers of wild hydrangea (Hydrangea arborescens) in the company of several other flower longhorns, including T. velutinus. The similarity of T. deceptus to T. velutinus makes distinguishing individuals amongst the vastly more abundant T. velutinus quite difficult. However, Tom was able to recognize the species during his surveys as a result of prior experience with it in Illinois. As Tom and I searched the wild hydrangea plants growing along an intermittent drainage between the road and the park’s unique mesic forest, we succeeded in picking out a total of four individuals of this species amongst the dozens of T. velutinus and other lepturines also feeding on the flowers. I gradually developed a sense of the subtle differences that distinguish this species from T. velutinus and that allow its recognition in the field. Typocerus deceptus is slightly more robust than T. velutinus, and whereas the transverse yellow elytral bands of the latter are distinct and well delimited, they are weaker and often interrupted at the middle in T. deceptus, giving the beetle a slightly darker brownish appearance. The lateral margins of the elytra are also more strongly emarginated near the apices, giving the beetle a more distinctly tapered appearance. Finally, while both species possess a distinct band of dense, yellow pubescence along the basal margin of the pronotum, this band is interrupted at the middle in T. deceptus. My ability to recognize this species in the field was confirmed a few weeks ago when I returned to Trail of Tears (with longtime field companion Rich Thoma) to attempt what seemed to be an impossible task – photograph these active and flighty insects in the field on their host plants. Conditions were brutally humid, and I only saw two individuals that day – the first I immediately captured and kept alive as a backup for studio photographs should I fail to achieve my goal in the field, but the second individual (not seen until almost two hours later!) posed just long enough for me to whip off a series of frames, two of which turned out well enough to share with you here. The first photo clearly shows the interrupted basal pubescent band, and both photos show the distinctly emarginate lateral elytral margins and weak transverse yellow bands (compare to the uninterrupted pronotal pubescent band and well developed transverse elytral bands of T. velutinus in the third photo). It is possible that T. deceptus is not as rare as it appears and is simply overlooked due to its great resemblance to another much more abundant species. However, I believe this is unlikely given its rarity in collections of eastern U.S. Cerambycidae by casual and expert collectors alike. Moreover, T. deceptus is not the only “rare” longhorned beetle to have been documented at Trail of Tears State Park – a number of other species have also been found there but not or only rarely elsewhere in Missouri (e.g., Enaphalodes cortiphagus, Hesperandra polita, Metacmaeops vittata, and Trigonarthris minnesotana). This may be due to the unique, mesic forest found at Trail of Tears, being one of only a few sites in southeastern Missouri that support more typically eastern tree species such as American beech (Fagus grandifolia), tulip poplar (Liriodendron tulipifera), and cucumbertree (Magnolia acuminata). Whether one of these trees serves as a larval host for T. deceptus is unknown. Nevertheless, I will be returning to Trail of Tears in the future to see what other treasures remain hidden within its unique forests. Photo details (insects): Canon 100mm macro lens on Canon EOS 50D, ISO 100, 1/250 sec, f/18-20, MT-24EX flash 1/4 power through diffuser caps. MacRae, T. C. 1994. Annotated checklist of the longhorned beetles (Coleoptera: Cerambycidae and Disteniidae) known to occur in Missouri. Insecta Mundi 7(4) (1993):223–252. MacRae, T. C. and M. E. Rice. 2007. Distributional and biological observations on North American Cerambycidae (Coleoptera). The Coleopterists Bulletin 61(2):227–263. 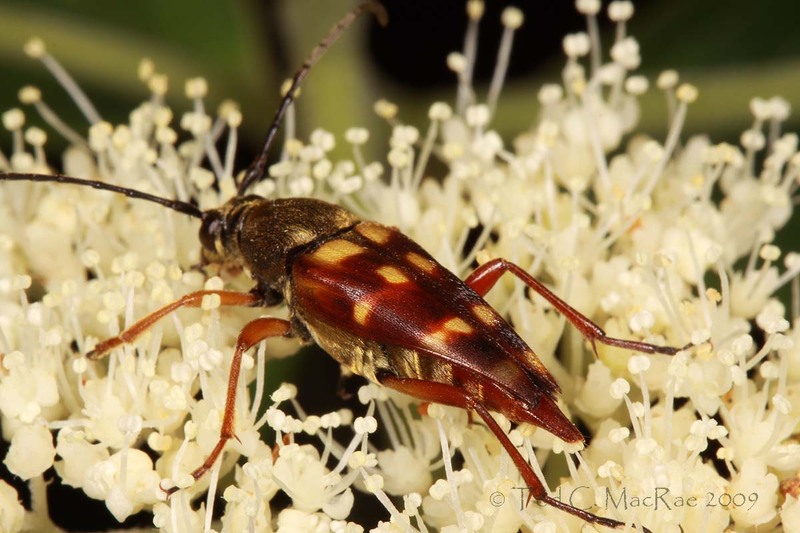 This entry was posted in Cerambycidae, Coleoptera and tagged beetles, entomologists, entomology, forest, insects, longhorned beetles, Missouri, nature, new state record, Ozarks, science, taxonomy, trees. Bookmark the permalink. Thanks for making the pdf files available. Soon you should start to write a book on the beetles of Missouri or at least one on Buprestidae and another on Cerambycidae. Based on your field work knowledge, published papers and your wonderful photos these should result in really great and outstanding publications. PS. Loved the great photo of the hunters! Hi Trevor. Your kind remarks are much appreciated. I’m trying to figure out a way to do a book on beetles. Just keep up the field work and photography and once you have a good coverage of genera/species, then put the book together systematically. Its hard work but rewarding. What a fascinating article Ted, that beetle is gorgeous. Longhorns have long been a favorite of mine. I will be in the South Eastern Part of Missouri on August 14, perhaps I will coerce my husband into a trip to “trail of tears” and see what I can photograph. Thank you, Shelly. Trail of Tears is quite a unique spot for Missouri – its cultural history is almost as interesting as its natural history. I have collected 2 or 3 long horn beetles that look similar to your Typocerus (sp. unidentified by me so far) found in the crowley’s ridge area. I will try to take some photos soon. Looks more like the velutinus sp. from your pictures but i’ll post it on my webpage. Cory, all of my photographs prior to May of this year were taken with a 6.2mp point-and-shoot camera, including many species much smaller than these longhorns. Go ahead and take the pics as close as you can and then crop – you’ll be might be surprised at how good they turn out. Cropping the photo’s really did help out. They are much more clear than before. Thanks, Lots of new photos up on the facebook. Thank you for your informative article. I found one of these today in my garden and captured it so I could identify it. As I am practicing organic gardening, I am interested in the insects that make their way into my garden to determine if they are beneficial or not. Due to the rarity of this insect, I released it. I am certain it was T. deceptus as it looks identical to the first two photographs. For your information, I am in South St. Louis County. Hi Dave – I could be convinced you saw T. deceptus if I was able to see the specimen and confirm its identity. Lacking that, I would have to assume it actually represented the much more common and virtually indistinguishable T. velutinus. I’m not saying that T. deceptus can’t occur in St. Louis Co., but it would be a surprising record given the amount of insect collecting that has taken place here over the years. Sorry it to so long to get back to you. I would like to post/send you a picture to see if it is possible to identify. I took a picture before I released it. Hi Dave – feel free to send a photo to me at tcmacrae AT att DOT net. Thanks so much! I was fighting with morphology of attennomeres and thought about your post, and the more obvious characters you shared. I knew I had horses instead of zebras, but given the lighting and optics it was ending up at zebra. I still don’t think you write enough. Thank you for sharing.